All staff members of the Optistyle Optical Salon are qualified opticians dedicated to their profession. Our experience over 30 years is the guarantee for our customers for preserving their perfect experience of vision. Apart from the high standard of professionalism, we take special care of establishing the appropriate environment. The exclusive furniture, the piano installed in the hall on which catchy tunes can often be heard as well as the advice of the spectacle stylist all serve the purpose of conjuring the choosing of spectacles into a pleasant experience for you. We adjust ourselves to your timetable. Call us now at phone number +36 20 438 8468. You are very kindly invited. “In the large neon-lit shops of shopping malls, it is not possible to establish a personal relationship that characterized the relations of the optician and the patient in the old. However, this is very important since a good optician knows our history, is aware of what solutions worked for us, and will recommend glasses or contact lenses for us on that basis. We would like to bring this back again, since the assembly line-like service in an optical shop would make it impossible to find the best solution for the patient. Here, we have created the atmosphere where people like to come. We take our time, and this makes it possible for us to provide a quite different level of professional work, and our patients have an agreeable time in our shop. This is what means the most for me,” says Salon Manager Klára Simó. Originating from Transylvania, Klára Simó started from afar, she obtained her first qualification there. Then, when she came to Budapest in 1990, she got a job in the first and only optical salon in the vicinity of Váci utca. At the time, optical shops were typically in small and crowded premises, and the salon with the fountain and crystal mirrors made a great difference. Within a few years, she became the leader of the salon, and later she took over the management of the Optirex optical shop on Szent István körút opposite the Vígszínház theatre. She spent 15 years there, get acquainted with the theatre world, and soon acquired a reputation by word of mouth for her kindness and attentive service. A number of prominent persons and public figures became her permanent patients. In 2011, a new chapter began in her life when she realized an old dream and opened her own shop in District 2 of Budapest. There was no doubt that music, her old passion, was to pay a role in the salon as well. So was born the Optistyle Optical Salon where piano music begins to play every day. 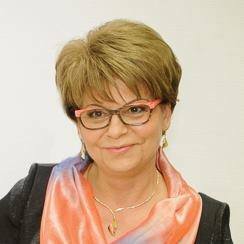 Klára Simó’s profession of faith and purpose is to make accessible personal and high standard optical services for everyone, and make choosing their glasses a pleasant experience.